Not all hamburger is created equal. It all contains a lot of fat, which we will deal with a little later. You can, in most meat markets, get your very own custom ground hamburger that contains just the cut of beef or your choice. Most of us just buy by price. But remember that the lowest priced hamburger will be made from meat scraps and contain a lot of fat. As the price elevates, the fat content goes down and the quality of the meat goes up. The only hamburger I would tell you to outright avoid is that which comes in the five-pound roll wrapped in plastic. That stuff is bad. Okay, now that we have our hamburger, what are we going to do with it? First thing that comes to mind is the hamburger sandwich. Meat and vegetables on a bun -- a complete meal in itself. There are a million variations on the basic hamburger. My favorite is the plain char-broiled burger. You make these on your grill. You will need a good, hot bed of coals to cook fast. You don't slow cook a burger. The mistake most folks make with their homemade burgers is getting the meat patty too thick. You don't want the patty to be more than one-half inch thick, thinner would be better. I put my hamburger in a big bowl and mix in the seasonings before cooking. A little salt and more black pepper is all you really need, but you can season it as you prefer. Some folks add finely chopped onion. I sometimes mix in a handful of crushed corn chips for a different flavor and texture. After the meat is well mixed with the seasonings, form it into balls -- size depends on the size bun you are going to put it on. If you have the little buns about the size of a hockey puck the ball of meat will of course be smaller than if you are using a plate-size bun. Best way to form the ball into a patty is to put it between two sheets of wax paper or plastic wrap. You can smush it out with your fingers or use a rolling pin on it. It doesn't have to be perfectly round unless you have some sort of compulsive disorder. The patties go over your bed of hot coals. They may tend to come apart when you are handling them but, will stick together as they begin to cook. You should use some non-stick spray or a light brushing of oil on your grill to prevent sticking. First question every novice burger chef has is "When do I turn the patties"? You turn the patties when the juices begin to boil up through the meat to the top surface. Then you flip them and cook about an equal amount of time as the first side took, and then add a couple of minutes. We do not eat rare hamburger. National Hamburger Month is May. You can toast your buns over the coals. You don't want to put the buns in a covered grill and leave them too long, they will dry out something fierce. Now that everything is done you assemble your burgers. Or you can put the "fixin's" out and let your guest dress their own burger. The accepted method of assembly is: onion on the bottom half of the bun. Next, the meat patty, then the pickles, tomatoes and top if with fresh, crisp lettuce. Mustard or other dressing goes on the top half of the bun. If you have to have a slice of cheese, it goes between the meat and the pickles. If you are lacking a grill or the weather is just too brisk to work outside, fried hamburgers are nearly as good as the broiled. Everything works the same except you use a heavy griddle or big cast iron frying pan for cooking. Get the pan or griddle real hot. You can turn the patties in the pan a little sooner than on the grill. You don't want them to scorch before the juices come through. After you flip the patty the first time, you mash it real good with your spatula. This forces the juice and the fat out of the meat. You're not going to squeeze out all the juice so that the meat becomes dry. You can use the corner of your spatula to cut a small opening in the patty to peek inside to check for doneness. When all the pink is gone to gray, it's done. The second most popular way to prepare hamburger is to make a meatloaf. Again, there are thousands of meatloaf recipes. Our favorite contains chopped onion, chopped bell pepper, canned tomatoes and crushed crackers. You might want to throw in a well-beaten egg to get things to stick together a little better. Form the meat into a loaf and cook it in a loaf pan or whatever you have. Use a meat thermometer to check for doneness. On a cold day, you might want to season your meatloaf just like you were making chili, except leave out the liquids. When you use hamburger for making sauces or stews or what have you that doesn't require a patty or loaf, you can remove nearly all the fat quite easily. 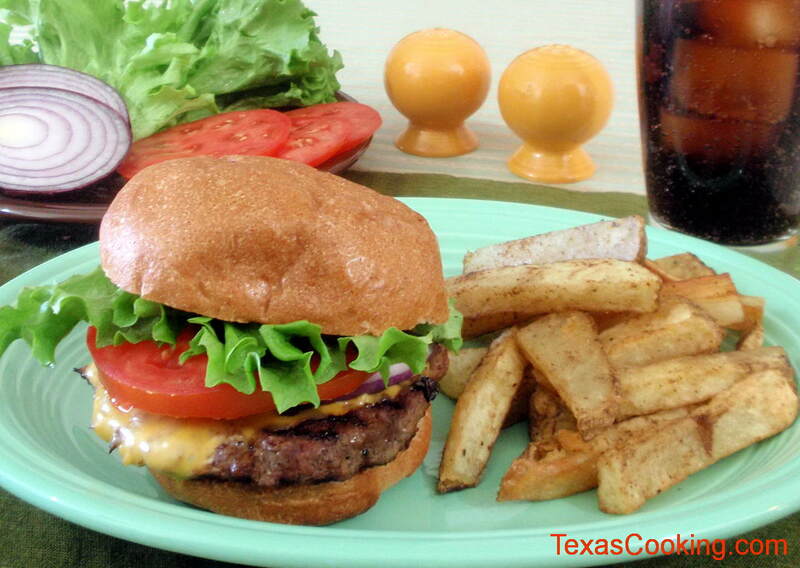 Put your hamburger in a lightly oiled, heavy skillet and break it up as it cooks. Cook it until it "gives up its liquid." You will know when that happens, since suddenly the pan is full of juice. Strain all the juice off the meat, and the fat is gone. Put the meat back in the pan, and add a little beef stock or beef bullion and water and the rest of your seasonings. It's better than that greasy kid stuff. So much to say and so little space. I've about used up my allotment of space for this time. I'll get back with you with some more good hamburger recipes in the near future. In a large sauté pan over medium heat, cook the bacon untl crisp, 10 to 12 minutes, turning occasionally. Remove the bacon and set aside on paper towels to drain. Remove the pan from heat. Gently shape the ground chuck into six burgers of equal size and thickness (about ¾ inch thick). Season both sides of the burgers with salt and pepper. Grill over direct medium heat until the internal temperature reaches 160°F for medium, 8 to 10 minutes, turning once halfway through grilling time. Top each burger with a slice of the cheese during the last minute or two of grilling time and allow the cheese to melt. During the last 30 seconds, grill the buns over direct medium heat until lightly toasted. Serve the cheeseburgers hot on a toasted bun with a lettuce leaf and a slice of tomato, topped with a slice of bacon. Serve with ketchup and mustard on the side, if desired.